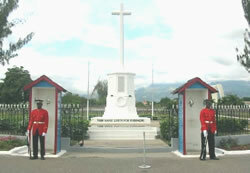 The area on which the National Heroes Park now stands was once one of the most popular spots in Kingston. For 101 years, the land was the centre for horse racing in Jamaica. It was also the site for other sporting activities such as cricket and cycle racing. Being a place where people naturally gathered, the area was also the venue for travelling circuses that visited the island from time to time. In 1818, the Kingston Council purchased the property for £985 and 10 shillings. Back then it was part of a property called Montgomery Pen. It was later known as the Kingston Race Course because of its dominant activity and remained so until 1953 when horse racing was transferred to Knutsford Park. August 2, 1838, grand festivities marking the end of apprenticeship and the beginning of full freedom were held here. Queen Victoria's Golden and Diamond Jubilees were honoured here in 1887 and 1897 respectively. 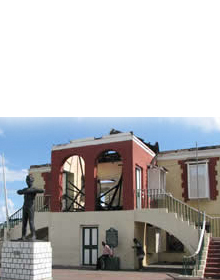 The Jamaica National Exhibition was held from January 27, to May 2, 1891, in a building called Quebec Lodge. 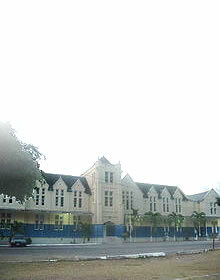 This site is now occupied by the Wolmer's School. In 1953, the Kingston Race Course was renamed the George VI Memorial Park in honour of the late King George VI, father of Queen Elizabeth II. 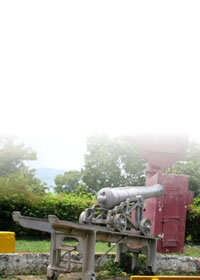 The grounds were prepared for the Queen's first visit to the island. In the same year, a War Memorial to honour those who died in the First World War was removed from its original location at Church Street and relocated here. Each year, on Remembrance Day, the first Sunday in November, veterans gather around the Cenotaph to honour the memory of those who died in World Wars I & II. 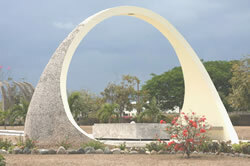 The site was officially renamed the National Heroes Park in 1973 and is now a permanent place for honouring our heroes whose monuments are erected in an area known as the Shrine. Another section, reserved for prime ministers and outstanding patriots, adjoins the Shrine area, to the north.